All ages will love this rustic lakefront home. Enjoy a rustic cabin getaway, located on 2 acres in the beautiful forest surrounding Hayden Lake! With seven bedrooms, a bunk room, plenty of living space—plus a detached 30’x40’ garage-turned-game room loaded with entertainment for children and adults alike—The Rancher is the perfect fit for groups large and small looking to get out of town and enjoy a lakeside cabin stay! Relax in the cozy living room by the stone fireplace while enjoying views of gorgeous Hayden Lake through the many large windows. The main living area also offers direct access to the large deck where you’ll find comfortable seating, a BBQ, and fresh mountain air with a lake view! When you’re ready for a swim, a gentle slope will lead you to the private beach. After a long day of playing by the lake, gather around the rock fire pit and enjoy roasting marshmallows as you watch the sun go down. You’ll be met with hours of entertainment in the detached game room, with activities including pool, air hockey, foosball, arcade basketball, ping pong, darts, chess, and even a poker table. When it's time to enjoy a meal, there's a seat for everyone. The dining room offers seating for six, plu an additional six seats at teh adjacent long breakfast bar. Steps away, you'll find a table for four in the living room. Those wanting to soak up the sun and view can set their plate on one of the outside tables that seat eight in total. This home also has no shortage of comfortable places to sleep! On the main floor, you’ll find six bedrooms with queen beds, including the master with an attached bathroom with a shower. An adjacent bathroom with a shower services the other bedrooms. There’s a bunk room with two sets of twin bunk beds located on this floor. Downstairs you’ll discover another bedroom with a queen bed, a bathroom with a shower—plus a small kitchen that includes a fridge, sink, and table for two. Why limit yourself to enjoying only one lake during your stay? 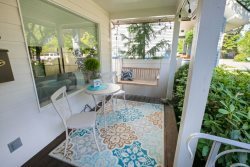 With a 35 minute proximity to downtown Coeur d’Alene, you can enjoy your coffee overlooking sparkling Hayden Lake and spend the afternoon paddle boarding, kayaking or boating on either Hayden Lake or Lake Coeur d’Alene. The lively downtown area offers a variety of shopping and dining options, as well as pristine parks, sandy beaches, volleyball, basketball and more -- all with that small town feel! Children and adults alike will enjoy relaxing and playing at this scenic Hayden Lake cabin! The team here is very reasonable and accommodating. Definitely will use vacation rental authority again. My only question was answered quickly. I was thankful I received a call to take care of the detail of arrival time. Nicole was great during the holidays. The house was exactly like the photos and perfect for our large family vacation. The snow fall over the holidays made it the perfect get away. Overall our family really enjoyed the house, but for the small issues we had. We all had black feet within minutes of taking off our shoes. We enjoyed the house very much and our time there was a blast. With a couple of minor changes it would have been perfect. And a popcorn popper would be a nice addition to the kitchen. Nice property, beautiful views, nice ranch dcor and lots of bedrooms. Fire pit used every night, dock for the boat was another very nice feature although the dock needs a little work and more cleats to tie up to. We had a great time!